So we are way behind on our Universal Yums! subscription box reviews. The August box arrived while we were in Disney and we haven’t even opened it yet! But here is a review of July’s box. The country for July was Japan. We still love how the featured country’s flag is represented by the tissue paper that the snacks are wrapped in. 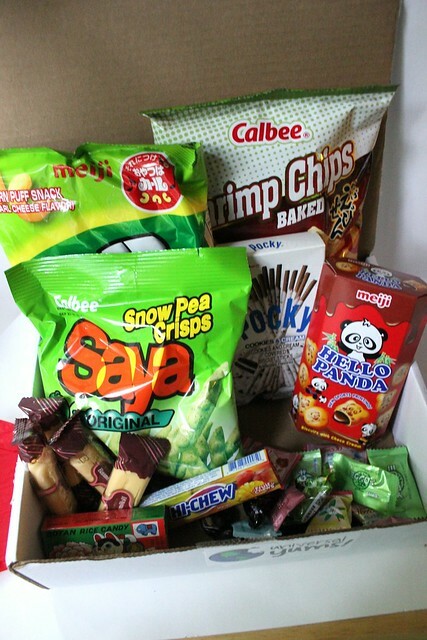 This box included a variety of snacks including candy and salty/crunchy type snacks. 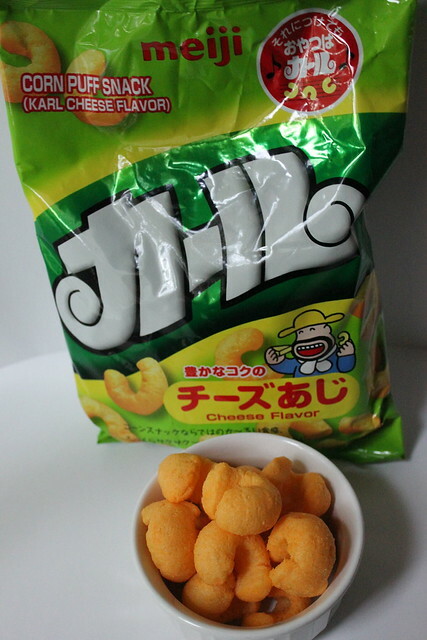 Karl Cheese Flavor Ji-Il (2.53 oz) – This was a decent size bag, large enough to share amongst the four of us. These were comparable to our cheese doodles in the United States, but with a milder cheese flavor that had a slight hint of sweet. We all liked these. 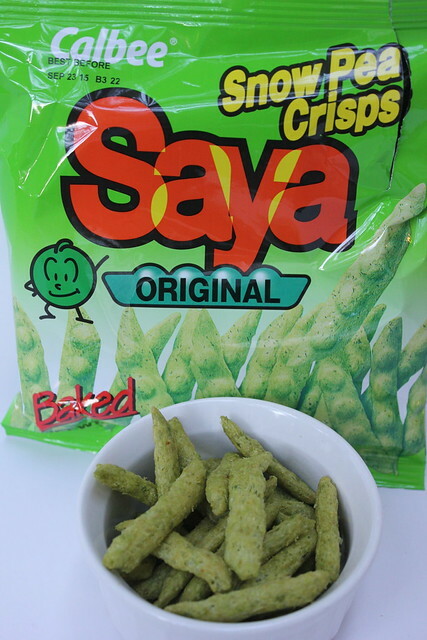 Calbee Saya Snow Pea Crisps (2.47 oz) – This was also a fairly large size bag of snacks. They have the look of a green cheese doodle. We found it interesting that the list of ingredients included tuna extract and natural flavors including rendered beef fat. We thought that these were just okay. Nestle Japan Aero Matcha Green Tea Milk Chocolate (2 pieces) – To be fair, we kind of forgot about this candy until recently and didn’t realize it was chocolate. So, a month or so later and it was squished and not in the best condition when we tried it. While Nestle makes this chocolate in a bunch of different flavors, we received the green tea variety. (I normally love the flavor of green tea and the Haagen-Dazs ice cream green tea is one of my favorite ice creams!) The Aero chocolate bar is supposed to have a “bubbly texture” that according to the Nestle website, “the bubbles collapse and then melt on your tongue to create a deliciously smooth chocolate sensation.” We did not experience this “chocolate sensation” possibly due to the dry, crumbled chocolate we had. This was just okay for us. Botan Rice Candy (3/4 oz) – This box had six pieces of rice candy inside, as well as a sticker. I didn’t realize until I couldn’t get the second wrapper off the candy that it was edible. It was weird since it was plastic-like but when you put it in your mouth, it melted. The wrapper encased a lemon-orange gummy candy. These were definitely different. 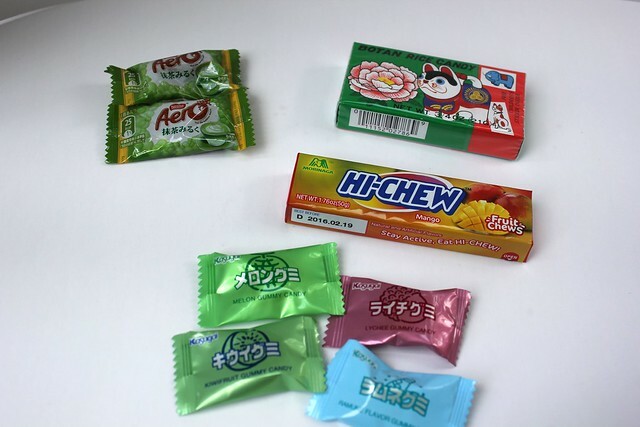 Morinaga Hi-Chew Mango Fruit Chews (1.76 oz) – There were 10 pieces of candy in this package. While the package and squares of candy looked like a Starburst candy, they were much chewier. Kasugai Gummies (4 pieces) – The box had four pieces of this candy including melon, lychee, ramune and kiwi fruit flavored. I tried the ramune flavor, which was supposed to be similar to a lemonade flavor. My daughter noted that it smelled like lemon cleaner, and she was in fact not wrong! I did not like or finish eating this candy. 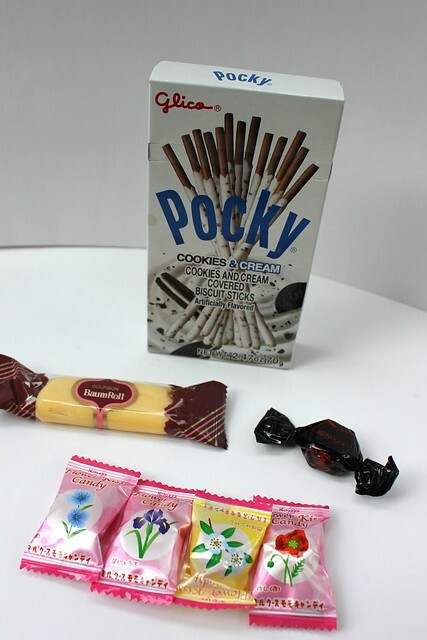 Glico Pocky in Cookies & Cream (2.47 oz) – This box of cookie sticks covered in a white chocolate and cookie coating is actually a product of Thailand, according to the package. We’ve had Pocky before and like it. I wasn’t a big fan of the cookies and cream flavor but the kids loved it. Kasugai Kuro Ame Brown Sugar Candy (4 pieces) – These black wrapped candies were one of my favorites in the box. The brown sugar candy was a piece of hard candy with a molasses flavor that reminded me of the classic yellow-wrapped Mary Janes. Kasugai Flower Kiss Candy (4 pieces) – These were hard, sweet pieces of candy. Although the candies had different flower wrappers, according to the information card, they allegedly all tasted the same. There wasn’t anything too special or different about these candies. Bourbon BaumRoll (4 pieces) – The box had 4 of these BaumRolls. They were a lemon-flavored cake covered in a light layer of icing. The cake was a bit dry and sweet, but overall not bad. 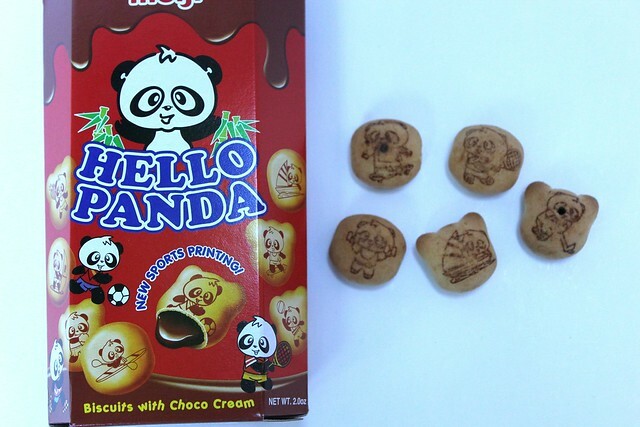 Meiji Hello Panda (2.0 0z) – These biscuits with choco cream are actually products of Singapore, according to the package. Each of these cookies, shaped in circles or panda heads, has a picture of a panda engaged in various sports including soccer, kayaking, skateboarding and more. The cookie reminded me of a Nilla wafer with a chocolate filling. We all enjoyed these. Overall, this box was a win. This box had a variety of treats that we could all eat and enjoy. Nothing was too spicy or “out there.” We can even probably stock up on many of these treats if at our local Asian grocery store. Look for August’s Universal Yums! box review coming soon! We are still finishing up the treats in the box and our September box just arrived! 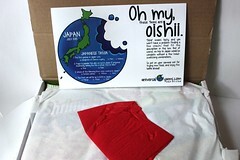 subscription boxes japan, universal yums! How neat! I had never heard of this box before. I have tried those Hello Panda things and they are yummy! I found them in the dollar spot at Target. What a cool subscription box!!! What fun. I can dream about all kinds of fun around this box. I love all the unique flavors in Asian candies. So neat. 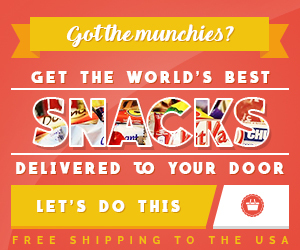 Since you’re interested in Asian snacks, you should check out Japan Yum’s snack subscription service. Their snack boxes include a variety of surprise Japanese snacks every month. I’ve never heard of this box, but it looks like a fun item to receive and share with the kids! I grew up on that Botan Rice candy, and love it! 🙂 Thanks for linking up with us at the Best of the Blogosphere!